KCAT Studio and Fergus Fitzgerald are very proud to invite you to his first solo exhibition at the Mermaid Arts Centre in Bray, Co. Wicklow. It will be running from the 8th February to 16th March 2019. A wealth of colour and texture! 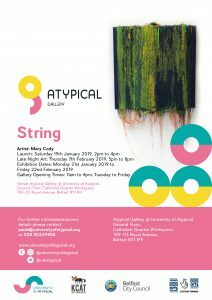 We are all looking forward to Mary Cody’s solo exhibition ‘String’ opening soon at the University of Atypical, Belfast. 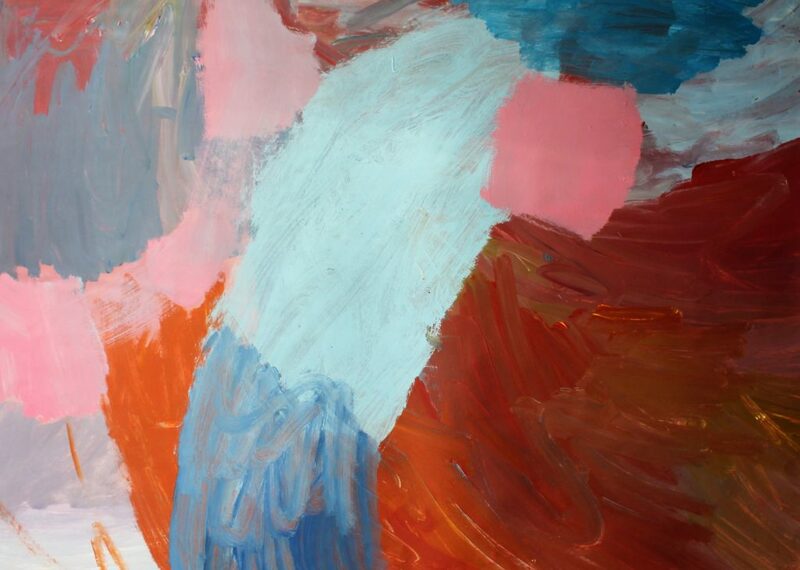 Mary’s practice investigates the material nature of painting today. Through her steady, considered and labour-intensive approach, layers of wool, string and acrylic are carefully articulated onto canvas. Only Mary knows when an artwork is complete and when the optimum level of balance is reached. The KCAT Studio is delighted to announce that we have launched an online shop for the Christmas season : the studio artists Andrew Pike, Brianna Hurley, Declan Byrne, Diane Chambers, Eileen Mulrooney, Fergus Fitzgerald, Fintin Kelly, Francis Casey, Jason Turner, Lorna Corrigan, Margaret Walker, Mary Cody, Sinéad Fahey will all have a variety of work on paper available. Any online purchases can be posted or alternatively collected directly from our studio. Should you choose to collect work from us, all delivery fees will be deducted. Please contact KCAT for suitable collection times. ’A Yoke’ a Solo Exhibition by KCAT Studio artist Lorna Corrigan will open this Thursday 20th September, 5:30pm at the Coastguard Centre Café in Tramore, Waterford. 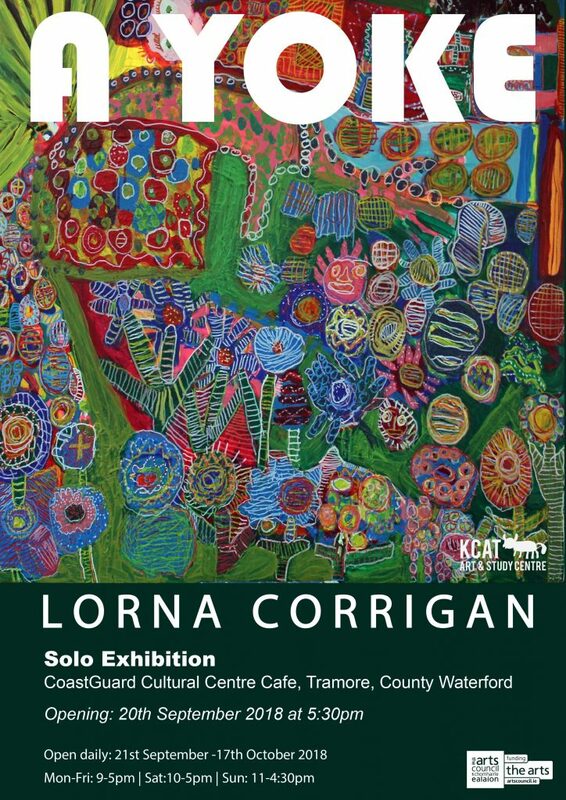 Lorna’s work weaves together imaginary elements from dreams with something as concrete as a cow standing in a nearby field or a teapot in the ‘Blue Coffee Shop’ on the street, few doors down from KCAT Studio in Callan, where the artist has her studio space. The show will run until the 17th of October and will be open daily. A successful collaboration between two artists was celebrated in Lavistown Garden Gallery during Kilkenny Arts Week this summer 2018. 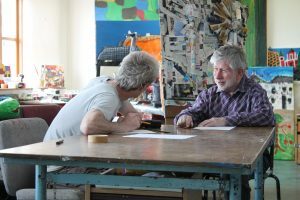 Anthony Donohue has been painting in KCAT Art Centre for ten years.Julie Cusack is a facilitating tutor in KCAT. Julie and Anthony ‘heard’each other with their eyes, with a shared sense of aesthetic.They were able to recognise themselves in each other’s work and a relationship of peer painting developed between them.Communication without words,communication of canvas, brush, colour, texture. ‘Talking in Paint’ traced the studio hours spent together and allowed us to eavesdrop on their painted conversations.Anthony does not express himself in conventional ways. He has been painting with broad brush strokes and a changing palette over the years and Julie works in abstract expressionism, often with landscape but using sources that vary from time to time. Anthony’s sources are a mystery to us. An internal landscape seems to emerge. He shares his moods which can be dark in colours of shade and heaviness; he shares his joy in pure yellow and variations of light. Both Julie and Anthony’s work can be viewed by appointment. Contact Alice on 0567755115 for more information. The students of visual courses in KCAT recently held their first opening of many exhibitions to come in St Luke’s Hospital. 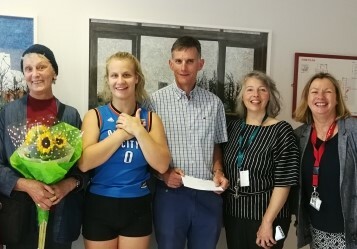 Students and friends of KCAT worked hard to raise funds to purchase sixteen custom frames which now hang permanently in the central axis lobby of the hospital.The work will be changed every few months or so in order to bring fresh interest to staff , patients and visitors. This collaboration will also allow as many students as possible the experience of exhibiting their work in a public space.The opening speech made by Gypsy Ray can be read below.We are most grateful to her, to Edelle Nolan ( Arts Officer in the hospital), and to tutors, Julie Cusack and Saturio Alonso for their continuing efforts and support. Congratulations to all the exhibiting students. KCAT Open Studio Exhibition Launch at St. Luke’s. The difficulties of wanting to create any art form, be it writing a poem, painting a painting, doing fibre art, or practicing an instrument can be finding the time to do it and it is often done in isolation. The stereotype of a writer is that she or he is locked away looking at a blank page hoping for the words to come. A visual artist is alone in a studio or at a table in some shed or corner of their dwelling trying to put idea to paper or canvas. A musician practices alone for hours before joining other musicians to play music. KCAT’s Studio Course provides a forum for individuals to come into a group setting but work with their chosen medium. There are two days a week set for the Studio Courses. People opt for full or partial days to come in to work. The group is facilitated by two gifted and talented artists, Saturio Alonso and Julie Cusack, who are there to offer help when needed, to give advice, and to be devil’s advocates when a studio member is “stuck”. It is often inspiring to see what others work on and sometimes this course produces collaborations between the group members. People with various talents are together without a system of one being a better artist than another. I have participated in the Studio Course and have benefited from doing so. The KCAT Studio Artists are pleased, I am sure, to be exhibiting on the walls here at St. Luke’s. Whether one is at the hospital as a staff member, a patient, or a visitor, the art now on the walls makes the hospital environment richer and, in many ways, more humane. It is wonderful to have it and a thanks goes to Edelle Nolan, arts officer, all the administration and staff at St. Luke’s who have helped make this possible. The American Painter, Georgia O’Keefe said, “To create one’s world in any of the arts takes courage”. The artists exhibiting here are courageous! Their work is testament to their courage. To the contributing artists I say WELL DONE, CONGRATULATIONS! I officially open this exhibit and invite you to let this work enhance your lives. 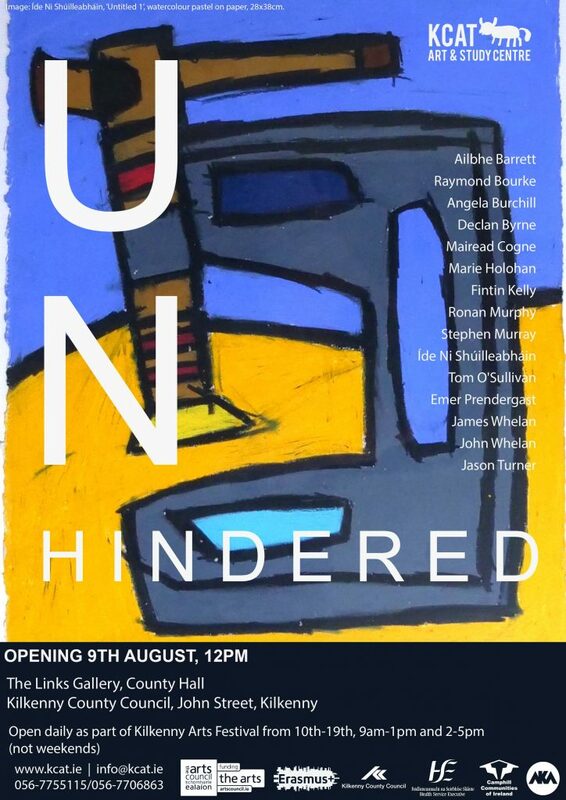 UNHINDERED – An exhibition of contemporary artworks curated by the KCAT studio. ‘Unhindered’ is an exhibition curated by the studio artists of KCAT, Callan as part of the AKA Fringe – Kilkenny Arts Festival. 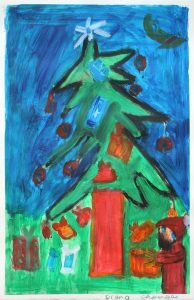 The exhibition will comprise of an exciting array of painting and sculptural artworks from artists working in supportive studio settings in Ireland. The diverse range of artworks will offer insight into the different working methodologies and their individual approaches to their practices. Concluding in an abundance of energy as the selected artworks bounce off one another and conversations begin to flow. Organisations represented include: Arts Ability (Wexford), DAV (Dublin), GASP (Cork), KCAT Studio (Kilkenny), Luisne Art Project (Mayo), Cuig and GASP (Cork) and (Dulick Centre (Clare). We do hope it will start a discussion around the current supportive Studio infrastructure in Ireland and how it can develop going forward. 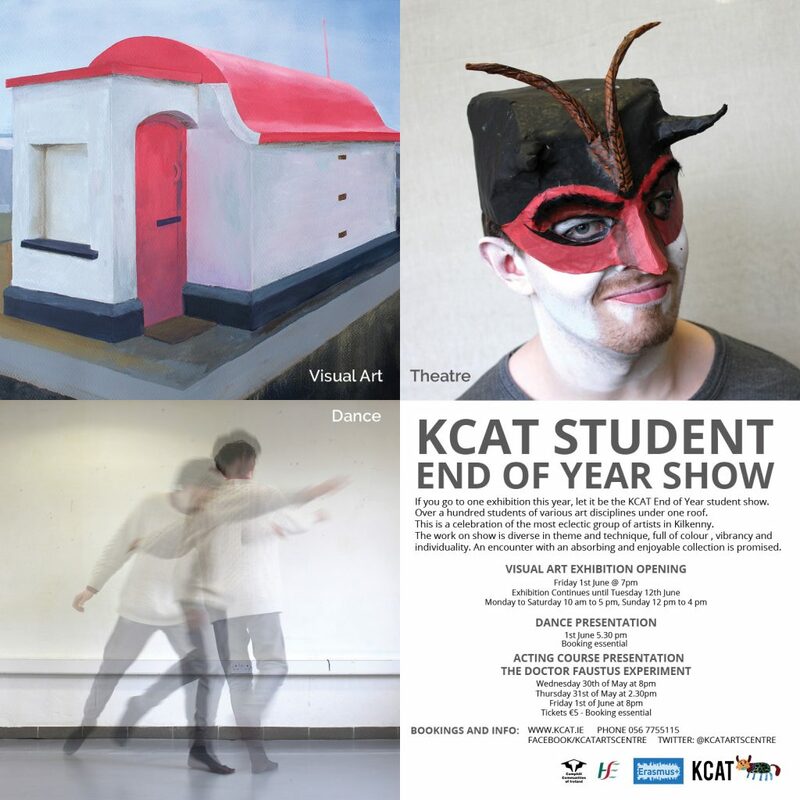 If you go to one exhibition this year let it be the KCAT End of Year student show. Over a hundred students of various art disciplines under one roof.This is a celebration of the most eclectic group of artists in Kilkenny. 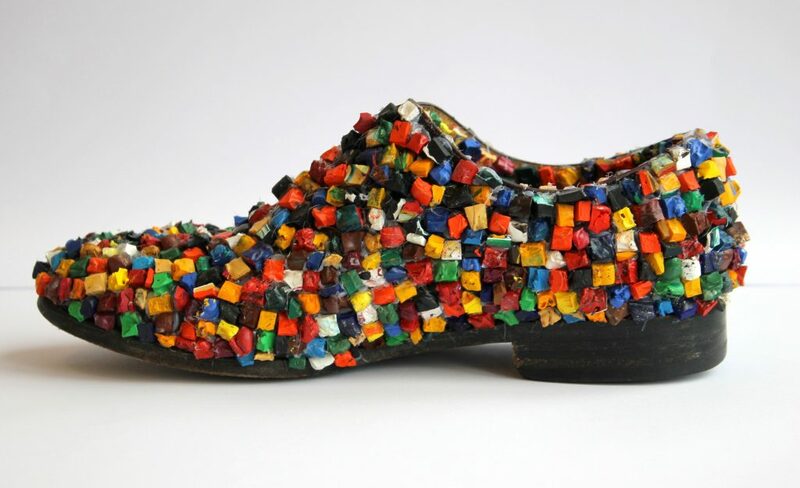 The work on show is diverse in theme and technique, full of colour, vibrancy and individuality.An encounter with an absorbing and enjoyable collection is promised. Encrusted Shoe, a sculpture by KCAT Studio artist Declan Byrne is on show as part of Cabinet of Wonders #6 at the Linenhall Arts Centre in Castlebar, Co. Mayo until 31 August 2018.